Yes, there really are low cost hotels in London. The English capital might be one of the world’s most expensive cities, but savvy travelers can still find centrally-located London lodgings with genuinely cool en-suite rooms for under £70, perfectly comfortable and clean rooms with a shared bathroom for under £30 and non-skeevy dorm beds for under £12. Second, instead of only reviewing one hotel, we’ve chosen two. The Berghotel Schafbergspitze is our choice as the best views from a hotel room, but the quality of rooms (as well as the hotel in general) is otherwise rather bland. Those who want their amazing room view to come along with some amazing luxury should check out the Ferienhotel Fernblick instead. The Big Baobab Bar has everything you'd find in a traditional British pub (except more ants). Sometimes the name of a pub describes exactly what it is. So it is with the Big Baobab Bar in Limpopo Province, South Africa. The “Baobab” in the moniker refers to a type of tree that’s native to Madagascar and found sprinkled throughout arid regions of southern Africa. The genus is colloquially referred to as “the upside down tree” — in the dry season, when baobabs sheds its leafs, the branches resemble underground roots. 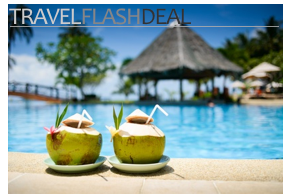 Flash Sale: $19 a Night at an All-Inclusive Caribbean Resort?! It’s the sort of sale headline that seems way too good to be true: $19 per night at an all-inclusive Caribbean beach resort! That’s the travel deal the cool website Cheap Caribbean is offering for the next three days. $19 a night! That’s with food, drink, accommodations and activities included at the Lifestyle Tropical Beach Resort & Spa in Puerto Plata, Dominican Republic. But what’s the catch? you are surely asking. Is the deal only for specific dates that are already sold out? Does the included food and drink consist entirely of pretzels and water? To qualify for the deal do I first have to survive a night in a haunted house? Spot Cool Stuff recently published a review comparison of the best Bora Bora luxury resorts. As we mentioned in that review, each of the nine resorts would looked at was spectacular in its own way. Each featured amazing views and impeccable service. Each also had nightly rates somewhere between expensive and exorbitant. So what’s a budget traveler to do? Contrary to image of Bora Bora as a destination only for the well healed, the tropical Pacific island can definitely be enjoyed on the cheap. There are a handful of B&Bs and small family-run pensions where couples can stay for under €100 (or even under €50). Among those, Spot Cool Stuff’s favorite is the wonderful little Sunset Hill Lodge. If you’re shying away from booking a cheap hotel in Barcelona because you’re concerned about landing in a travel nightmare, worry no more. The following three hotels, hostels and apartments in Spain’s capital of fun are quite classy. They’re also quite affordable. When you visit Berlin will you stay in an artsy boutique hotel? In a low cost hostel? In a trailer park? The wonderfully cool thing about The Hüttenpalast is that the accommodations are all three of those—at once! At Spot Cool Stuff we’ve reviewed more than our share of unusual hotels. But rarely have we found one that offers such an unconventional experience with such a relatively high level of comfort at such a relatively low price.